One of the biggest challenges in the 21st century is assuring the security of people and communities in Asian megacities. This means fulfilling basic human needs, overcoming local pollution issues, reducing disaster risks, and empowering individuals, families, and communities to deal with such threats. However, putting the technologies, systems, administration, controls, and governance in place to implement these objectives, their systematic management, and developing human resources is a slow process. In short, enhancing human security will need additional efforts. Civil engineering, architecture and other engineering disciplines have long traditions as academic systems of field based problem solving. In order to establish human security in Asian megacities, however, engineering needs to develop into a more comprehensive discipline that encompasses fields such as urban management strategies, urban policy measures, and to promote education and research based on such comprehensive studies. 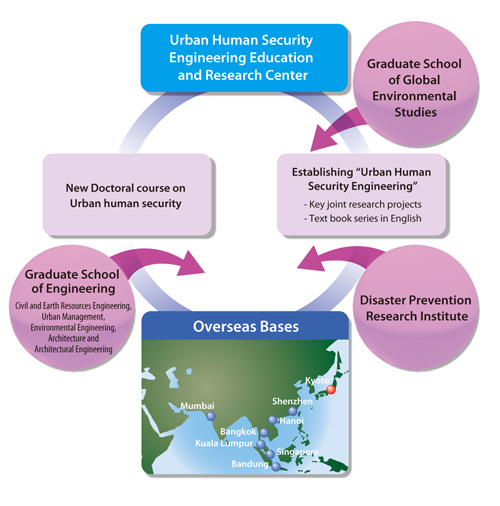 In this five-year program, Kyoto University will establish a new discipline "urban human security engineering" and create a network of overseas bases for research and education in Asian-wide scale to foster next generation researchers and high-level practitioners. Through this program, we will contribute greatly to solving human security issues in Asian megacities.